From tossing wooden poles to dancing and bagpipes, the Highland games are an event to be enjoyed by all. As they continue to expand internationally we take a look at how they began and why they are so popular all over the world. The first Highland games is not on record, but some say it was 2000BC and took place in Ireland before it was later adopted by Scotland. Its meaning is still the same today, an event designed to bring together sports, culture and community. The Act of Proscription in 1746 had a big impact on the Highland games in Scotland. The act saw a ban on Highlanders wearing traditional Scottish garments such as kilts and tartan. It lasted for 36 years, changing a whole generation’s customs and traditions and the identity of Scottish Highlanders. Fortunately, the Highland games saw a revival beginning in 1781 at Falkirk, encouraging the Scottish community to celebrate their history and customs. The Highland games became a tradition once more – kilts and all! Not long after the revival, the games made a move across the pond and the USA had their first games in 1836 in New York. San Francisco’s first games started 30 years later with The Caledonian Club in 1866 and the St Andrews Society of Detroit. Both of which are two of the oldest continuously running games in the USA. In total, there are now more than 200 annual games and gatherings outside of Scotland including in the US, Canada, New Zealand and Australia. At the Foundation, with our headquarters in New England, we like to attend the New Hampshire Highland Games which takes place September 16-18, 2016. Click Here for a listing of Highland games across the US, Canada and UK. So what does a day at the Highland games look like? The games are a mixture of sport and culture that is traditionally Scottish and of course a lot of fun for all to enjoy! They take place in Scotland every weekend from May to September totaling over 80 Highland games annually – that’s a lot of tartan! Sporting at the games, whether its throwing a ball or a very heavy caber, it’s definitely survival of the fittest and Scotland’s very own version of Total Wipeout. 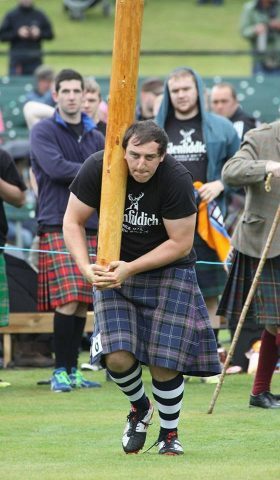 The caber toss is a full length log made from Scot Pine, usually weighing about 175 pounds! The aim is to run and throw the caber from its base and have it land in line with the original run. A straight toss is referred to as “12 O’clock” and the tosses are judged by how close to this position they are. This is perhaps the most iconic sporting event at the games, but there are also hammer throws, shot puts and tug o’ war competitions. Baron Coubertin, founder of the modern Olympics, witnessed these sporting events at a Highland display, influencing him to include both hammer throw and shot put in the Olympic program we known today. An iconic element to the games are the bands of pipers and drummers who travel to compete against one another and for solo titles at the festivities. When they aren’t competing they are lending a hand (and set of lungs) to help the dancing competitions keep tempo. Now, it is fair to say that the majority of highland dancers today are not men like they used to be. It is now predominately girls that partake in this performance. The sword dance is particularly common and the dancers compete for titles in solo and groups. One of the most renowned games for the highest level of Highland dancing is the Cowal Highland Gathering (where my best friends mum coaches the girls) hosting the Scottish and World Championships. 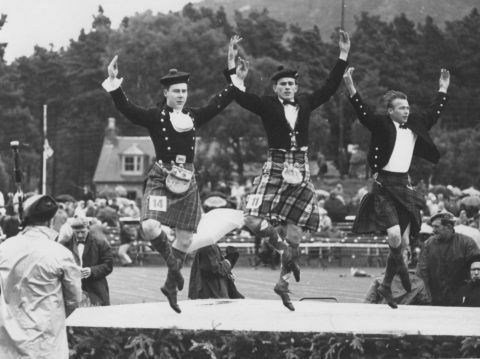 One of the most famous games in Scotland is the Braemar Gathering, as it is quite literally fit for Royalty, with the Royal family attending. Held on the first Saturday of September, this year will mark the 200-year anniversary. 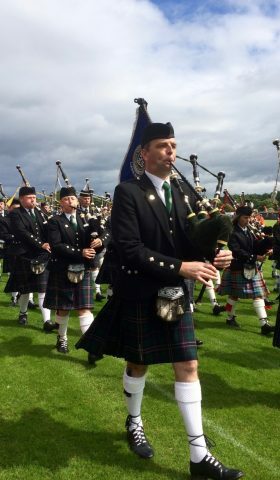 A day at Braemar includes international athletes taking part in the sports, pipers, dancers and H.M. forces taking part in the InterService Unit Tug ‘o War Championship and in the Services Medley Relay Race. And of course, Scottish Pipe Bands will also be there. Situated just a few minutes west of the Braemar Gathering is NTS site Mar Lodge Estate which occupies nearly 7% of the Cairngorms National Park, covers some of the most remote and scenic wild land in Scotland, including four of the five highest mountains in the UK. Mar Lodge was built in 1895 as a Highland Sporting Lodge for the Duke and Duchess of Fife, Queen Victoria’s granddaughter. The Lodge offers a spectacular venue for vacation, weddings, and corporate functions. On Friday, the 2nd of September (the night before the Braemar Gathering) the estate will be hosting “The Gathering Ceilidh” in the famous Stag Ballroom to celebrate the eve of the gathering. Overnight accommodations at Mar Lodge Estate will put anyone in the spirit of the Highland games – making a stay at the Estate perfect if you are attending the games for the weekend!